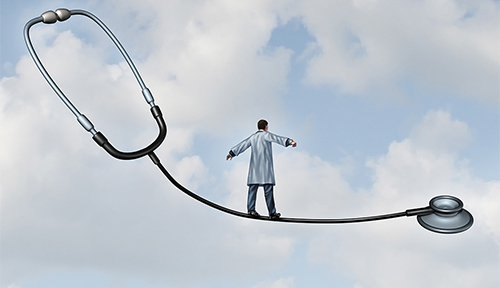 Medical decisions health care concept with a doctor in a lab coat walking a tight rope made from a stethoscope on a blue sky background as a metaphor for hospital therapy risk versus benefit as a balancing act for successful patient therapy. Genetic information is already being applied clinically, with genomic testing on tumors providing insights into treatment routes, and the knowledge base will continue to grow. But before this technology can be widely adopted and implemented into clinical care, major social, legal, and ethical issues need to be addressed. Thought leaders convened late June at the first Festival of Genomics in Boston to discuss crucial elements of the genomic revolution. Essentially at some point in the future, individuals will have their complete genome sequenced; the data will be securely stored; and clinicians will reference the information throughout a patient’s lifetime. Doctors will be charged with ordering the tests and will need accessible and easily interpretable reports in order to apply the results in the clinical setting.